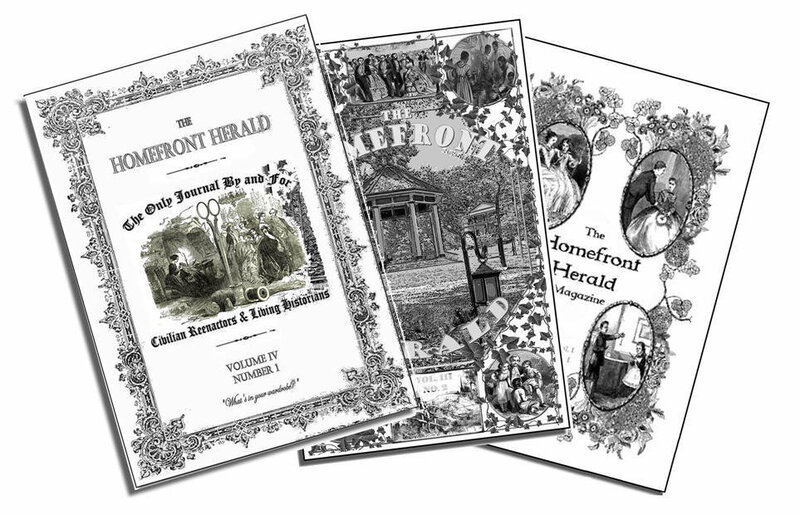 We are proud to offer past issues of the only publication by reenactors and living historians, for reenactors and living historians. Each issue is printed in black and white, so you can take it on the field and still look authentic. We have the desire to honor the past through living history, to encourage integrity in reenacting, and to offer a forum for those with expertise and research to share with others in the hobby, thereby improving and inspiring all. The Homefront Herald welcomes you! Proudly brought to you by The Homefront Herald, Inc. Available at Needle and Thread in Gettysburg PA, and at Corner Clothiers and Timely Tresses during most major Civil War Events, including The 1860s Civilian Celebration, Remembrance Day, Corsets and Cravats, The Ohio Regimental Military Ball, and many others.